Articles that have appeared in Allied Press publication Otago Daily Times from August 2010. The bars include the Metro in Lower Stuart St, which, it emerged at a hearing yesterday, is facing a Liquor Licensing Authority hearing next year that may result in licence suspension. A Dunedin City Council hearings committee of Crs Colin Weatherall, Lee Vandervis and Andrew Noone yesterday heard applications for later opening from Pop, the 10Bar, Craft Bar, Ratbags, Di Lusso, Barakah and Southern Break. The application from Metro was heard separately. For the past few years, bars have been able to open until 3am on “sacrosanct” days of Good Friday, Easter Sunday, Christmas Day and Anzac Day, with the ability to do so viewed as acceptable under council policy. But police this year opposed the move. Southern Break manager Yassine Al-Kaissi told the hearing the period was an important time for people in the hospitality industry to meet after they had finished work, and some without family to celebrate Christmas with needed somewhere to go. Asked by Cr Weatherall why the committee should allow the bars to break the rules for the sacrosanct days, he said while he understood the importance of Christmas, “over time, things change”. Dunedin liquor licensing Constable Neil Kettings said senior sergeants in Dunedin were wondering why staff had to work on the sacrosanct days to deal with early morning drinkers. The only practical way to deal with the issue was through a law change, rather than not respecting the law, he said. Asked by Cr Vandervis why the issue was being “brought to the fore” now, Const Kettings said attitudes to alcohol-related harm were changing. Metro owner Robert Dale told the hearing he wanted later opening on Christmas morning to deal with the problem of people leaving all at once, at a time with few taxis. Metro’s application was also opposed by police, and Const Kettings said, in his letter of response to the application, ongoing problems police had encountered during the year offered “no encouragement at all that they [licensee and manager] are suitable in the running of a licensed premises”. Police have applied for a suspension of the bar’s licence. A hearing expected in late January. Concern the proposed Wednesday farmers market could take customers away from Saturday’s established railway station market has been raised by vendors. The Otago Farmers Market Trust wants to establish a market in the car park of the Congregational Christian Church of Samoa, in South Dunedin, operating on a Wednesday between 3pm and 7pm, initially during the summer months, although consent was sought for a year-round operation if needed. On Friday, a hearing committee comprising Crs Colin Weatherall (chairman), Paul Hudson and Lee Vandervis heard from the trust and four submitters. Afife Harris, a Saturday market vendor, said a second market in Dunedin could damage the Saturday market and there was no serious evidence to show support for such a market, especially in times of recession when returns were lower. She was also concerned the trust was considering another market with full facilities when it did not provide services such as toilets, water or electricity for the Saturday market. Saturday vendor Brian Miller, director of Aquarius Gardens, said he was opposed to the application as he was also concerned the new market could take customers away from the Saturday market. Graham Potter, a Macandrew Rd property owner, said his main worries were noise, especially at night from trucks with air brakes, and also a loss of privacy and security. “The ordinary people in those houses haven’t been considered enough,” Mr Potter said. Elizabeth Kerr, who was involved in the beginnings of the Saturday market, said she supported the second market, as the trust was an experienced and considerate operator, and a good neighbour. It was likely to develop according to customer demands in South Dunedin, she said. Otago Farmers Market general manager John More said the market would allow people to buy fresh food and produce at competitive prices. The market would open to the public between 3pm and 6pm each Wednesday, with an hour either side allowed for vendors to set up and later pack up. It was unlikely someone on Macandrew Rd would hear the portable generator to be used at the market but Thomas St residents might. Mitigation factors would be considered, he said. A traffic management plan would be developed to mitigate concerns people had regarding parking and traffic movements. However, large-scale measures could affect the viability of the market. Traffic engineer David Gamble, on behalf of the trust, suggested the speed around the market be reduced to 30kmh. Although Macandrew Rd was classed as a district road, its 6500 traffic movements a day was not a large number. It was thought up to half the expected visitors would arrive on cycles or foot, leaving about 500 cars to park in a three-hour period. Cones and traffic managers would be used to help people park and cross the road. However, until the market was held, it was difficult to know what measures would be needed, he said. Dunedin City Council planning staff recommended the application be granted subject to conditions, as it considered likely adverse effects could be mitigated. The hearing panel adjourned to consider its decision. Dunedin’s Forsyth Barr Stadium is to get a $4.8 million addition to house the New Zealand Academy of Sport’s South Island performance centre. Sparc confirmed a $1 million grant for the two-storey building yesterday, meaning work can now start to have the building ready in time for the Rugby World Cup next year. The Dunedin City Council, which will own the building through its Dunedin Venues Ltd company, will meet the remainder of the cost. Carisbrook Stadium Trust chairman Malcolm Farry said the decision to proceed with the project – approved almost unanimously by the council at a meeting yesterday – was “almost as exciting as getting the stadium on its way”. The academy’s move from its home in the former art gallery at Logan Park has been on the agenda since 2005, with the cost included in the council’s $15.7 million Logan Park redevelopment plan. The council’s contribution will come from that budget, which has been approved as part of the council’s annual plan, meaning no further impost on ratepayers than that already signalled. Mr Farry said academy users would have access to a running track to be created under the stadium’s roof, which could be used all year round. There would also be input from the scientific community, the University of Otago and Otago Polytechnic, alongside the technological innovations of Dunedin businessman Ian Taylor and access to elite coaching. Both the Otago Rugby Football Union and the Highlanders have confirmed they will take leases at the new building. Sparc has agreed to conditional funding of $200,000 for fitting out the building with dedicated coach and athlete services. Mr Farry said the sporting hub the building would eventually become would rival the results achieved by the Australian Institute of Sport. For departing academy chief executive Kereyn Smith, yesterday’s decision was “the icing on the cake” after her decade of work for the organisation. Athletes at the academy would have not only the facilities in the new building and the stadium, but direct access to nearby Logan Park. A report to yesterday’s council meeting said completing the building before the world cup would have great advantages for the stadium’s operation. The report, from community life general manager Graeme Hall, said it would allow the stadium’s media facilities to be relocated to the north stand, meaning extra corporate facilities where media would have been in the south stand, and allow television coverage to include more advertising on hoardings and banners. Dunedin Venues Management Ltd chief executive David Davies told the meeting the corporate facilities would add up to $2 million to the stadium’s budget over the period they were leased, and the advertising “hundreds of thousands of dollars”. The 1700sq m academy building, which would be built above a one-storey block already beside the north stand and run about three-quarters of the way along the stand, would cost about $1.9 million less than the other option, a stand-alone building on Logan Park. It would extend over the footpath in front of the stand, providing cover for spectators queuing in bad weather. Mr Hall said detailed design work would begin now the project was approved, with the tendering process to begin early next year. Councillors at the meeting accepted the advantages of a building at the stadium, and the facilities that would come with it, compared with a more expensive building elsewhere. Mayor Dave Cull and Crs Neil Collins, Jinty MacTavish, Kate Wilson, Andrew Noone, Colin Weatherall, Paul Hudson, Richard Thomson, Lee Vandervis and Chris Staynes voted for the project, while Cr Teresa Stevenson abstained. Knox Church minister Sarah Mitchell opened yesterday’s Dunedin City Council meeting, as usual, with a prayer. She also lit two candles to represent hope, peace, joy and love, and while the candles stayed alight, the human qualities they symbolised flickered as the meeting progressed. A review of the committee structure and delegations manual, a matter that would usually take up little debating time, became the focus of an evident clash of personalities at the local authority, when Cr John Bezett called for an amendment to the make-up of the working party to consider the matter. A report from governance manager Sandy Graham described the manual as “a complex document that assigns powers and functions of the council to various committees”. The report suggested the committee be made up of Mayor Dave Cull, deputy mayor Chris Staynes, Crs Syd Brown, Kate Wilson and Lee Vandervis, and two council general managers. Cr Bezett suggested the councillors involved instead be heads of the council’s four committees, Crs Brown, Wilson, Andrew Noone and Bill Acklin. He realised that meant Cr Vandervis would miss out. Cr Richard Thompson said Cr Vandervis might be more inclined to ask difficult questions, but Cr Bezett said “constructive” questions might be better. Cr Teresa Stevenson suggested the committee could be the committee chairmen and woman, and Cr Vandervis, but Cr Bezett said he would “leave my amendment as it is”. Asked later if he thought Cr Bezett had a problem with him, Cr Vandervis said “that’s always been my impression”. Cr Bezett “seems to have a problem” with him being on any committee. .
“He seems to think I have enormous powers of persuasion. Cr Vandervis was not a chairman, and would not bring extra experience. His “hard” questions were always asked in public, in a way that embarrassed staff and would be reported in the media, and were not constructive. “That’s just a ploy he’s got. Thompson, Vandervis, Wilson and Mayor Cull voting against. Another motion was carried that included the committee chairmen and woman, and Cr Vandervis, on the working party. … after Cr Lee Vandervis called for a non-public discussion … to be in public. The future of the New Zealand Academy of Sport, South Island, may become clear this week, in an outcome Dunedin Mayor Dave Cull yesterday described as “an opportunity for both the academy and the city”. Discussion on the issue was adjourned yesterday, after debate on a report in grey papers, or the non-public part of a Dunedin City Council meeting. That debate would begin again on Friday, but this time in public, Mr Cull, who campaigned at the election this year on a more transparent council, said last night. In May, the council approved a plan to develop facilities for the academy at the Forsyth Barr Stadium. Conceptual plans were developed for a building of about 1200sq m at the northeast corner of the stadium. From there, it would be able to use the free areas at the east end of the stadium, and the field itself, for more than 20 codes and 250 athletes it worked with, making the roofed stadium a high performance hub. The city agreed to provide the academy with a headquarters when Dunedin was picked as its South Island home. The academy’s move from its home at the former art gallery at Logan Park has been on the agenda since 2005, under the council’s $15.7 million redevelopment plan. The money to pay for it would come from that budget, and the academy has been been negotiating to attract funding from Sparc. Debate yesterday centred on what aspects of the issue could be discussed in public, after Cr Lee Vandervis called for a non-public discussion in yesterday’s council meeting agenda to be in public. Cr Syd Brown said the academy had a valued position in the city, and Dunedin had competition from Christchurch and Auckland to provide a home for the organisation. Mr Cull stopped the discussion when Cr Teresa Stevenson started discussing Sparc’s involvement. He said last night he could not say much more until Friday, but a report would be written by then that could be openly discussed. A non-public discussion on the Otago Museum levy was not discussed at the meeting yesterday, Mr Cull said, as more information was needed. That issue arose after questions about the use of public funds at the museum, and chief executive Shimrath Paul’s use of a late-model Audi, prompted a warning future funding could be on the line. It’s time for another look at the way we elect our city council. The single transferable vote (STV) system is producing results that are not in line with the will of the people, and parts of its administration are dangerously undemocratic. In theory, the goals of the STV system seem admirable, but in practice the problems are are too many for it to be allowed to continue. Dunedin is one of just a few local bodies using STV. The 2004 decision to change from first past the post (FPP) was hard-fought and narrowly determined in a poll demanded by the citizens. Just 51% of a 44.3% turnout voted for the change. The main argument in favour of STV was that proportional systems like STV and MMP enable the election of a fairer representation of a cross-section of the community. The other side of the argument was that STV would prove to be far too complicated to work effectively and the system was never designed for situations like New Zealand’s local body politics, where party affiliations usually play a relatively minor role. The Green Party was a big supporter of proportional representation systems. The late Rod Donald famously compared STV to buying a Lotto ticket, which, he said, clearly most New Zealanders could manage. Experience has proved him wrong. There’s a large gulf between buying a Lotto ticket and voting effectively under STV. The contest for the 11 seats in the central ward of Dunedin city in 2010 illustrates the problem. Despite advertising campaigns and screeds of instructions, public knowledge of what voters were supposed to do with their ballot papers remained at a very low level. Confronted with a list of 39 names, what did you have to do? Number 1 to 39? Number 1 to anything at all? Put a tick beside everyone you liked? Any or all of the above? There was even less knowledge of how to vote strategically to get the people you wanted and eliminate the people you didn’t want. Advice and comments were offered by a range of contributors to this and other newspapers. Many of the writers demonstrated they had no idea how votes are actually calculated and did not understand the complex interconnectivity of each vote under STV. Before the election, it was clear to many candidates and their supporters that there was a widespread demand for change in the governance of the city. Yet the election resulted in very little alteration in the makeup of the council. Why was it so difficult to effect the changes the people seemed to want? In my view, it was because the system is too complicated for voters to use properly and because it incorporates biases. Most informed voters, with their own agendas in mind, no doubt allocated their top numbers to the names they knew. Thus the demand for change was reflected in the fact Dave Cull, as the well-known face of the new group seeking change (and of course as a mayoral candidate) topped the council voting. Second came Richard Thomson, prominent and respected for his battling role in health. Other high-profile candidates, such as Lee Vandervis and Bev Butler, drew early attention, either positive or negative, depending on the stance of the voter. A significant number of electors gave their top numbers to candidates who were seen as representative of identifiable groups such as Greens, students, Maori and Sort the System. But once the known and preferred names were taken care of, it seems many people, informed or otherwise, either stopped numbering or kept adding numbers by working their way down the page and giving sequential numbers to the names they recognised. This, of course, tends to favour existing councillors. Starting at the top of the page and working down is a process as natural as breathing, and it means the order of listing is a hugely important factor. I believe the results show alphabetic voting was common. There is a clear trend that favours the names nearer the top of the list. The elected council itself had decided, though not unanimously, that candidates should be listed alphabetically, rather than randomly. To achieve a result, STV relies totally on the rank ordering of the candidates. Ranking of individuals is a haphazard, unreliable and, in this case, irrelevant procedure. Since I live in the central ward, my right and responsibility is to elect the 11 people I think are best equipped to run the city for me. I see no point in rank ordering the 11 I want elected, let alone going down the list perhaps as far as number 39. The average voter (there were 33,906 in the central ward) in fact ranked fewer than 10 candidates, while 1068 determined punters went all the way to 39. How on earth they differentiated between the virtual unknowns in the bottom quarter of the list is a mystery, although sitting councillor Michael Guest was rewarded with the highest number of 39th placings of any candidate. When you add to all those complications the fact two different voting systems were operating on the same voting form – FPP was used for the Otago Regional Council – it’s no wonder 1230 votes were not able to be counted at all. And even if the majority of voters really understood the system, it wouldn’t produce quite the council the voters wanted. In this election, the complicated way votes are counted, redistributed and in some cases discounted worked against some candidates who were seen by a sufficient number of voters as solid, worth a place on the council but not usually ranked in the highest numbers. It has been enlightening to take a fresh look at the election results. Reworking the available numbers by counting the first 11 votes on each voting paper, which is almost the same as converting the election back to the old FPP system, you get a different outcome, one that more accurately reflects what the central ward voters wanted as their first 11. Nine of the 11 who were elected would have got in under any system. But the other two places would have been won by Lynn Tozer and Chris Marlow, at the expense of sitting councillors Bill Acklin and Paul Hudson. Ms Tozer, for example, was more than 700 votes ahead of Mr Acklin in a first past the post count. However, under STV, Mr Acklin and Mr Hudson, despite having fewer voters, moved up through the redistribution process because the votes they did get tended to carry higher rankings. The other problem, a major one about which a democratic society like ours should be truly alarmed, is that the system is not at all transparent. Only with great difficulty and some reasonable computing skills can the public get any picture at all of why the voting ended up the way it did. If the outcomes run against intuition or expectation, there is, as Bev Butler found out, nothing you can do about it except be willing to spend the thick end of $100,000 to buy a recount. Incidentally, no-one seems to have asked asked why it would cost so much. A public explanation would be a fine thing here. But the whole data-entry and software system is a “Trust me, I know what I’m doing” situation: we are assured it has been tested, is foolproof and cannot possibly be interfered with or used to alter outcomes in any way. That may be so, but how do we know? And in the event of a recount, if the second set of figures differed from the first, which version would be more likely to be right? Both counts would have been done in the same way. It’s a disturbing situation when a private company, Electionz.com, appears to hold the rights to the only software that can be used to count the votes and produce the results. The Department of Internal Affairs claims it developed the system. Who owns it now? How did the private company come to be in a monopolistic position to profit from it? So in summary, what’s the argument for STV? It’s supposed to make councils more representative. In the election of councillors for the Dunedin City Council central ward, with only one exception, it didn’t do that. Basically, it replaced one elderly male with one young female. So STV failed for the large ward. And in the other two ward elections and the mayoral contest, it made no difference. The solution is a return to first past the post, with randomised order of candidates’ names on the ballot sheet. Full randomisation means every voting paper is different, eliminating the effect of the top-of-the-page syndrome that is otherwise inevitable when 39 candidates are seeking 11 seats. The debate needs to start now. Warwick Johnson is secretary-treasurer of Greater Dunedin (Inc). The views expressed above are his own, and do not necessarily reflect those of other members of Greater Dunedin. The Dunedin Prison Charitable Trust has received a grant from the Dunedin Heritage Fund to prepare a conservation plan for the decommissioned Dunedin Prison. The work would be part of an overall assessment of the cost – and viability – of possible future uses for the empty 114-year-old brick building. But trust spokesman Stewart Harvey last night said the money would have to stay with the council “until all the boxes we need to have ticked, are ticked”. It had to refile its application for incorporation because it acknowledged it might want to have a commercial operation – a cafe or restaurant – at the prison, Mr Harvey said. The trust is on the Economic Development Ministry’s trusts register, but had been “stood down” as a registered charitable trust pending a “rejigged” application. It was also waiting for the commercially sensitive, Department of Corrections-led disposal process to get to the point of actually disposing of the building. “We are in a state of limbo. Nothing, really, has changed since March, but we are doing what we can to be ready for when it does,” Mr Harvey said. Heritage Fund committee chairman Lee Vandervis said he was unaware the trust was not incorporated when it applied for the grant. The committee supported the trust’s aims – but the grant would not be allocated until “all the i’s are dotted and the t’s are crossed”. In other grants from the council and New Zealand Historic Places Trust-administered fund, Corstorphine House received $20,000 to restore, from autumn next year, a historic conservatory that owner Paul Facoory said “needs some work”. The Gasworks Museum Trust received $29,327.52 to restore its forge; a $10,000 grant and an $8050 loan were allocated to help restore dry stone walls on Peter Wheen’s Highcliff Rd farm; $11,400 was granted to prepare a conservation plan for Cargill’s Castle, and $5000 was allocated to reinstate historic chimneys removed from a double-bay villa in George St.
Sports journalists may get a different home in the Forsyth Barr Stadium, as its developers look for new ways to maximise its income. The Carisbrook Stadium Trust is considering moving the media box from the south to the north stand in a move it hopes will ultimately be cost-neutral. Trust chairman Malcolm Farry said the change, which was still being developed, was not critical to the project “but could make quite a lot of economic sense”. The media box would not replace seats in the north stand, but it would free up space for more seats in the south stand. That would mean the venue had more seats and corporate packages to sell, and more chance to develop a solid stream of new operational income. Dunedin city councillor Lee Vandervis suggested at the council’s finance, strategy and development committee meeting this week that it might mean infrastructure such as lifts would have to be installed. Mr Farry said he expected the swap to be made cost-neutral “by what we save on the south side”. He confirmed the old plans were considered by Rugby World Cup officials, but that the potential change was not an issue. Options were also being considered for the Academy of Sport moving to the back of the north stand. Discussions continued with suppliers of the 5000 relocatable seats needed for the stadium. At this week’s committee meeting, trust member Stewart Barnett said officials expected to make financial and design decisions by late January. The seats would be considered an operational cost and were factored into the stadium’s budget, Mr Farry confirmed later. An audit report says the way the Dunedin City Council controls its purchase-card system is “sound” but staff need more direction on what they can use their cards for. The report also says managers should be reminded of the importance of reviewing staff use of the cards and the council should look at new software to help monitor it. Auditor WHK was asked to review how the council controlled its Bank of New Zealand purchase-card system in the wake of an inquiry into staff card use. That inquiry found council staff charged more than $4.8 million in 26,000 transactions to the council’s 206 civic purchase cards over three years. The top 36 managers and four personal assistants charged $534,500 to council cards and about $100,000 was spent on food, coffee, entertainment and drinking. The inquiry also found the council had about one card for every three full-time equivalent positions, one of the highest card-to-staff ratios in the South Island. The council asked WHK to identify the key risks of the system, assess how the council controlled the risks, and review what it did after a review in 2005. It was not asked to comment on the number of staff who had purchase cards. The audit found the council’s overall control of the purchase-card system was “sound” and the process allowed a range of reports to be generated to help keep an eye on spending. The cards were supposed to be used for “necessary business expenditure” but the council’s draft sensitive-expenditure policy did not say what that sort of spending could be. It also did not say what could be deemed “hospitality expenditure” – a “sensitive” expenditure category that also had opportunities for personal benefit. The audit said the best safeguard against improper use of the cards was the review and approval of transactions by managers. Managers should be reminded of the importance of diligently reviewing transaction reports. BNZ had replaced its purchase-card software with an online version with new functions, and the audit report recommended the council investigate it. It noted council managers received reports detailing spending at “prohibited” businesses and giving transaction information to help their assessment. Meanwhile, transaction limits would be lowered so more transactions would be reported in the “transactions exceeding limits” report. Refresher courses on appropriate card use were also planned, the report noted. Council chief executive Jim Harland could not be contacted yesterday, but he told the council’s finance, strategy, and development committee on Monday the recommendations had, “in the main”, been implemented. He told councillors staff were talking to the BNZ about its new reporting regime but the extra cost of $25,000 a year was “questionable in terms of benefit”. He was confident the card-based system was more efficient than a paper-based invoice system and, in response to a question from Cr Lee Vandervis, that there was no spending “culture” at the council that needed to be addressed. Cr Jinty MacTavish asked why the audit team was not asked to comment on how many people used the cards. Mr Harland said there was no established, pan-councils “best practice” to measure it. Cr Teresa Stevenson said the hospitality spending could boost business if staff “circulated” to more cafes. Mr Harland said any cafe visits had to be based on a legitimate, council-focused need. Cr Stevenson suggested staff who did not use their cards as much as others could be rewarded with a muffin shout. • WHK was separately engaged to help analyse a random sample of 650 transactions made by council staff over the past three years. That report was expected before the end of the year. Charging film-makers $500 a day to work around Dunedin could penalise small productions and undermine a local industry that runs on the smell of an oily rag, city councillors say. They have knocked back a plan requiring commercial productions to get a permit to film on council-owned land, and have asked officials to see how things are done in Wellington. Mayor Dave Cull told the finance, strategy and development committee that film-makers should be charged where they used council services, or when they caused disruption or closed streets. However, a $500 a day fee, or $250 half-day fee, would be too much in a city where many small, “barely commercial” productions “quite literally run on the smell of an oily rag”, Mr Cull said. Council economic development unit manager Peter Harris on Monday told the committee that applications to film on council land were considered on an ad hoc basis and that only standard reserves and facilities fees were charged. The council missed out on valuable information about film activity in the city, and there was no system in place to recoup the $20,000 it gave each year to film promotion and facilitation co-operative Film Otago Southland. The fee would not apply to non-commercial or volunteer-run enterprises, but there was a reasonable expectation – many films had permit fees built into their budgets – that businesses should pay, Mr Harris said. The new permit would redress the information imbalance, recoup about $10,000 in its first few years, and bring the city in line with similar charges levied in the Queenstown Lakes and Waitaki districts. Those districts had “got it in the ear” from companies annoyed they were charged to film there when they were not charged in Dunedin, Mr Harris said. The interjurisdictional anomaly “cut no mustard” with Mr Cull, while Cr Richard Thomson urged caution on what would effectively set a pan-region “price” on filming. Cr Thomson wondered whether the disputes as to what constituted commercial filming were worth the $10,000 revenue, and noted film crews spent a lot of money in the city even without a per-day fee. Cr Jinty MacTavish said even “commercial” local film-makers would struggle to pay the fee in a city where their customers’ budgets were tight, before Cr Lee Vandervis successfully asked officials to report on the Wellington City Council’s permit system. 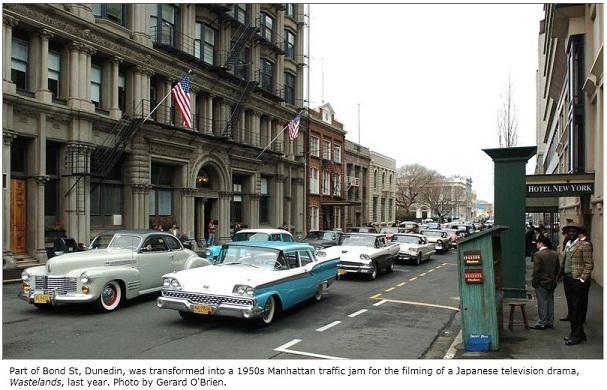 Cr Vandervis, who has worked on large film productions, said Wellington charged location fees instead, and its myriad locations helped promote the city across the world. Dunedin film producer Zoe Hobson, a member of the Film Otago Southland board, yesterday welcomed news the council was looking for a way to track the value of film to the economy. But low budget, usually less-than-commercial local film-makers should not be treated the same as big-budget producers who often already expected to pay permit fees. “Fees on the scale of $500 a day would be huge for most small productions, so I would hope that whatever the council comes up with has some discretion built in,” Ms Hobson said. Film industry GDP value to Otago (2008-09): $23 million. Full-time jobs created (2008-09): 168. New businesses created (2008-09): 45. Economic benefit to Dunedin (2009-10): $1.058 million. Proposed DCC permit charge: $500 a day, $250 half day. Charge’s estimated value in first year: $10,000. Dunedin City Council’s annual contribution to Film Otago Southland: $20,000. The Dunedin City Council looks set to increase its capacity to borrow by $250 million to provide security for gross debt that should hit $712 million by 2013. 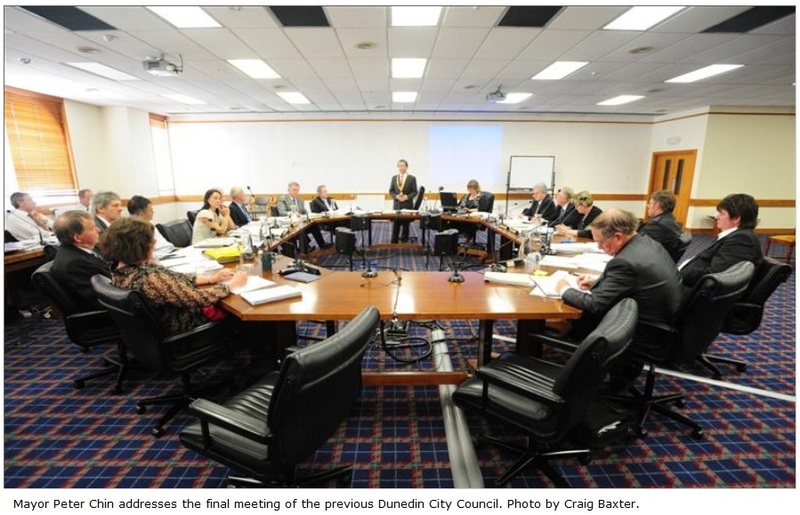 Its finance, strategy and development committee yesterday agreed by just one vote to get the council to increase Dunedin City Holdings’ (DCHL) uncalled capital to $850 million. The increase was sought as gross debt climbed towards $594 million this financial year – just $6 million less than the current borrowing limit. That meant council borrowing could be restricted if the uncalled capital was not increased, finance and corporate support general manager Athol Stephens warned. If that happened, the Tahuna outfall, the Dunedin Centre upgrade and the Otago Settlers Museum redevelopment – which all straddled financial years – might remain unfinished. It would also limit the long-term flexibility of council companies to take advantage of any “excellent commercial investment opportunity” that would increase dividends. The uncalled capital is held by DCHL, but DCHL borrowing is done by council-owned Dunedin City Treasury (DCTL), with the uncalled capital used as security for lenders. As planned debt increased, so did the level of security DCHL needed to demonstrate to lenders. It was like security on a mortgage: like a homeowner, DCHL would never want to need to draw on its security – “if you have to call it, you’re in trouble”. The increase did not mean debt would rise to $850 million: debt was forecast to decline gradually once projects, including the Forsyth Barr Stadium, were completed. Cr Kate Wilson said an indebted business would cut its spending rather than increase its overdraft, and asked whether the $850 million gave more headroom than was needed. Mr Stephens said the DCHL and DCTL boards felt it was reasonable and that to ask for much less would mean having to ask for more sometime earlier than the five-yearly average. Cr Lee Vandervis said he was unhappy the council was being asked to increase the uncalled capital when the total gross debt was within just $6 million of the borrowing limit. That DCHL might ask for more in five years implied “the rampant spending” driven by an unsustainable council spending culture would continue. Cr Richard Thomson said the allocation should not signal the money was there to be spent. The amount could be argued, but the council would be irresponsible to not meet its commitments. Crs Brown, Bill Acklin, John Bezett, Neil Collins, Paul Hudson, Andrew Noone and Richard Thomson voted to recommend the council increase DCHL’s capital by $250 million. Crs Wilson, Vandervis, Jinty MacTavish, Chris Staynes, Teresa Stevenson and Mayor Dave Cull voted against the recommendation. The total gross debt projections for the Dunedin venues group was listed as $135 million for 2011-12 in the report to the finance strategy and development committee yesterday. Last year, Mr Stephens said the council would borrow $109 million to fund the Forsyth Barr Stadium. The stadium, and its debt, would be owned by Dunedin City Council-owned company Dunedin Venues Ltd (DVL). Asked about the $135 million figure, Mr Stephens said the company would also take private-sector funding debt, which was about $30 million. Because cash from private-sector funding, from the sale of tickets, would not begin to be paid until about the time the stadium was finished next year, the money has been covered by raising debt. Mr Stephens said it would “come in quite quickly” once people started paying for their seating packages. Plans being drawn up by the Dunedin City Council to spend up to $96,000 on a replacement toilet at Karitane are causing a stink among councillors. The proposal to build the toilet block at the Karitane foreshore reserve was presented to this week’s council community development committee meeting, after a request during the 2010-11 annual plan hearings early this year. The staff report that resulted, prepared by council parks and reserves team leader Martin Thompson, outlined the options to councillors at this week’s meeting. It said a replacement toilet – paid for from within existing budgets – was the most cost-effective way of providing a new facility that met modern standards. The existing toilet in the area, built in the 1950s, was deteriorating. Mr Thompson’s report did not contain a detailed estimate of the project’s cost, but noted a similar toilet block built earlier this year at Ocean View cost $96,000. The new Karitane facility would have two stalls but because there was an existing sewer connection in the area, it was unlikely to cost $96,000, he said. However, the figure caused concern for Cr Lee Vandervis, who warned councillors accepting the report might prompt the community to expect a $96,000 spend “on what essentially is a two-stall bog”. “I’m a builder’s son and $96,000 for a two-stall bog is outrageously over the top,” Cr Vandervis told the meeting. Council community and recreation services manager Mick Reece agreed concern about costs was “important”, but stressed he “sincerely hoped” the final cost would be reduced during the tender process. Mr Thompson said $96,000 was the “maximum cost of replacement”, but community input through the Waikouaiti Coast Community Board could yet shape the proposal. Other councillors also raised concerns about the toilet. Cr Jinty MacTavish suggested there was interest in the community for a new toilet design that incorporated a composting facility. Council community life general manager Graeme Hall said such toilets were “excellent” where sewage facilities were not already in place, but the council wanted to avoid doubling up on facilities and costs where sewerage already existed. The proposed toilet would be discussed again at the next committee meeting early next year, after input from the community board was obtained. Whether motivated by civic duty, by a desire to avoid a second public gaffe or just by a nice piece of cake, Cr Lee Vandervis managed to remember to attend his second public engagement yesterday. Cr Vandervis was Mayor Dave Cull’s representative at the opening of the 2010 Wishing Tree Appeal in Dunedin, days after he forgot to attend a Remembrance Sunday church service on behalf of Mr Cull. Cr Vandervis was given the honour of cutting a Christmas cake and presenting the first gift on behalf of the city to launch yesterday’s charity appeal, and praised organisers for their event. The nationwide appeal is running for the 16th time this year, and has so far collected 220,000 gifts from members of the public across New Zealand to distribute to the less fortunate, Kmart organiser Dawn Barnes-Gardner said. 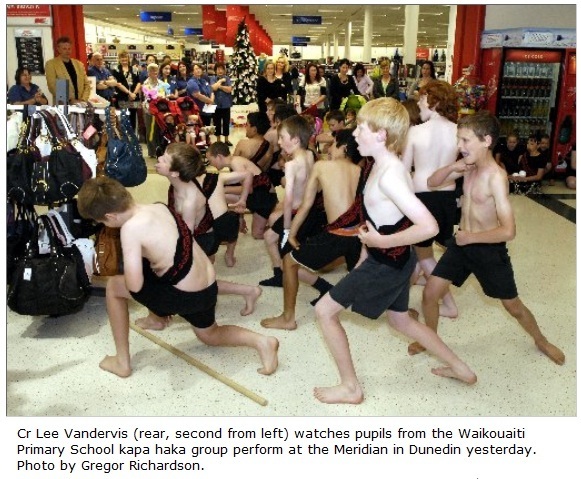 Dunedin’s appeal collected 2000 gifts last year but aimed to gather 2500 this year, she said. The gifts would be distributed as they came in, until the appeal closed on Christmas Eve. At yesterday’s launch, children from the Pine Hill Children’s Centre placed gifts under the tree and pupils from the Waikouaiti Primary School kapa haka group performed a karakia. Vandervis raised the idea at yesterday’s Dunedin City Council community development committee meeting, as councillors considered the timeline for a development plan for the road to be prepared. The development plan was expected to be presented to councillors early next year, detailing the features needed to safely separate various road users – and their likely cost. That followed the council’s decision last month, after extensive public consultation, to reinstate restricted vehicle access once a shared walking/cycling lane and other improvements were added. However, Cr Vandervis said yesterday temporary barriers – like those used at the Southern Festival of Speed – should be installed first, to trial the effectiveness of separating different road users. “That way we could check to see whether this solution would be acceptable to everybody,” he said. If the temporary barriers proved effective, it was possible more permanent – and aesthetically pleasing – barriers could be installed later, he said. Council community and recreation policy team leader Lisa Wheeler, whose report was being considered, welcomed the suggestion and said the staged implementation of whatever the development plan recommended could be an option to be considered. That could be especially useful if the development plan identified relatively costly work was required, she believed. Committee chairman Cr Bill Acklin asked for the development plan to be completed in time to be considered during the council’s 2011-12 draft annual plan hearings in January next year, allowing further public input. The Dunedin City Council has realigned its policy on Lovelock Ave, reversing its decision on a project that has been years in development. While the decision chimed with Mayor Dave Cull’s promise to take a look at council spending, it emerged not all of the $1.2 million earmarked for the project will turn out to be savings. Some newer councillors at a meeting yesterday seemed to have at best limited understanding of the project and its extensive history. In the end, the project’s backers were told to go away and redesign the project, and come back to the council with a plan that did not involve realigning the road. The realignment was part of a plan developed by Dunedin Botanic Garden managers to extend the rhododendron dell, relocate propagation houses and administration buildings, and deal with what they said were safety issues related to the road. The project would have included a new information centre and entrance in the upper gardens, and was part of a larger $6.5 million strategic plan for the garden. It was supported by the Friends of the Dunedin Botanic Garden, but opposed by many Opoho residents. Upon his election last month, Mr Cull made sure upcoming tenders were not signed. The matter was the subject of a sometimes tortuous and confusing debate yesterday, not helped by plenty of unchallenged discussion between councillors, rather than through Mr Cull as chairman. During questioning from Cr Lee Vandervis, community and recreation services manager Mick Reece said the cost of the road was between $700,000 and $800,000, with $400,000 to bury a pipe from a nearby reservoir tank. Cr Richard Thomson said the council should not accept the $1.2 million tender for the work. Cr Vandervis said he felt sorry for council staff who had worked for some time on the issue, but “we need to make a decision now”. While it was uncertain how much would be saved if the realignment did not go ahead, Dunedin people had an affection for Lovelock Ave as it was. But Cr Bezett said councillors were making a decision “on very little information”. The least the council could do was have a workshop, or take newer councillors for a walk in the area. People had worked for years on the project, he said, and he estimated that the savings could be as low as $120,000. After about three hours’ debate, Crs Cull, Vandervis, Thomson, Teresa Stevenson, Chris Staynes, Kate Wilson, Neil Collins and Jinty MacTavish voted not to go ahead with the realignment. Crs Bezett, Syd Brown, Bill Acklin, Paul Hudson and Andrew Noone voted for the project. There was a further vote on the legal aspects of the matter, and it was decided a special consultative procedure should take place on the future of the project, once new reports on its future were put together. That would take place at the same time as the council’s annual plan next year. At a planning and environment committee meeting before the council meeting, councillors voted to go ahead with an investigation into opening the Caversham railway tunnel and developing a cycleway to Green Island and Mosgiel. Most agreed with the plan, though Crs Brown and Collins opposed, saying the message at election time was to save money, rather than start new projects. A Dunedin city councillor has offered his “most sincere apologies” after an embarrassing gaffe when he forgot to attend a Remembrance Sunday church service at which he was to represent the city.Lee Vandervis was to represent Mayor Dave Cull and give a reading at the service at St Paul’s Cathedral yesterday, but failed to show, leaving Dean Dr Trevor James to fill in for him. Mr Vandervis yesterday said he felt terrible when he realised he had forgotten the appointment at the service, which marks an international day of remembrance of all those who served, and continue to serve, in conflict and peacekeeping efforts around the world. The councillor sent his apologies to the organisers of the service, and all those who attended. It was his eldest son’s wedding on Saturday and Mr Vandervis said he got up yesterday, tidied the house and had a nap, completely forgetting his appointment at the service. He had particularly liked the reading he was to give and had even practised it earlier in the week. But yesterday morning the whole thing just “totally went out of my head” and he did not remember the 10am service until about lunchtime. In an email sent yesterday afternoon to service organiser Robert Montgomery, from St Paul’s, Mr Vandervis offered his “most sincere apologies for letting you down, and for letting Mayor Cull down”. The excuse of having imbibed too much at the wedding was not even available as he did not drink, he said. When contacted, Mr Cull, who had a prior engagement, said it was unfortunate Mr Vandervis had forgotten the service. “I’ve forgotten things in the past. It’s a shame, but what’s to be done? I’m sure he wouldn’t have done it on purpose. “Ultimately, I have to take responsibility for this as he was there representing me,” he said. Dunedin RSA president Alan Goding said it was disappointing not to have had a representative of the council at a Remembrance Sunday service for the first time in his memory. Residents likely to be affected by the Caversham Valley highway redevelopment want the Dunedin City Council to help them get a better deal. They yesterday urged the council to advocate for ratepayers concerned over noise from the government-owned highway. Council infrastructure services committee deputy chairman Lee Vandervis, whose electoral ward includes the highway, said he would take their cause to his colleagues. The council could not force the New Zealand Transport Agency to change its plans – but he believed it had a role to play in highlighting residents’ concerns. “We are not talking about a rural road; we are talking about a highway cutting through a high-density urban area. His pledge followed Leckhampton Court resident Tony Ambrose’s plea for the council to help residents as they tried to get 1.8m-high noise barriers, starting from Glen Rd. Residents aired their concerns about road noise at a meeting NZTA organised in July, and organised a petition last month when NZTA suggested high barriers had been ruled out. Mr Ambrose acknowledged the highway was not the council’s responsibility, but said it could still take the residents’ case. South Rd resident Sarah Campbell-McKenzie organised a petition to encourage NZTA to build 1.8m-high barriers. She said many of the 120 signatories knew very little about the highway plan, and she urged NZTA to discuss the project at another public meeting. “A lot of the people I’ve spoken to tell me they [NZTA] haven’t given any information – it is as if NZTA has decided to talk to some people. “But this affects everyone who lives alongside it, and up the hills,” Ms Campbell-McKenzie said. Highway project manager Simon Underwood was unavailable for an interview, but said in an emailed response that NZTA contacted Glen area householders who lived within 80m of the new highway as they were most likely to have an interest in the project. They and anyone else who expressed an interest were invited to the public meeting in July. NZTA had also been operating a consistently updated project-information website since May. Mr Underwood said specific noise barriers were not considered, in part because the Glen area was steep. Houses were well above the highway, so noise barriers would have to be very high to have a significant effect. Concrete 1.05m-high roadside crash barriers were likely to be installed instead. Concrete barriers, rather than steel guardrails, were chosen to further minimise the noise already dampened by low-noise road surfacing. Mr Underwood pointed out the four-laning project, for which a final decision on funding should be made this month, was designed to allow existing traffic to flow more freely rather than to cope with a lot of new traffic. NZTA consultants last month monitored road noise at several properties at the Glen end of the highway. The results of that work should be available this week, an NZTA spokesman confirmed. My councillor experience of Mayor Peter Chin’s mayoralty was that of a man with usually gentle manners who played the role of an essentially ceremonial mayor. He was proud of his record of leading a council which he worked hard to keep happy by avoiding direct confrontation, acquiescing to spending, and by avoiding involvement in DCC detail. This style contrasted sharply with that of former mayor Clifford Skeggs, now Sir Clifford, whose autocratic style surprised me when I first ran unsuccessfully for council in the 1980s. These differing approaches coincided with significantly different effects on Dunedin rates and debt. Sir Clifford’s businessman’s reign saw low rate rises and debt, while Mr Chin’s tenure has seen unprecedented high rises in both rates and debt. Mr Chin was fond of saying publicly that the mayor had just one vote, and his style was humble, often to the point of being self-deprecating. Privately, he appeared to value his A-Team majority of eight usually compliant councillors to smooth the passage of staff paperwork through council. If one accepted the mayor’s role as simply a facilitator with ceremonial duties, Mr Chin’s focus and prowess in these roles would cast him as a successful, inclusive mayor. My view is that ceremonial facilitation is just part of the mayor’s role, and that it also vitally requires checking staff aspirations, costs, and information supplied, promoting the city and specific initiatives, and ensuring that all decisions are representative, properly consulted on and in the interests of all of Dunedin. Unlike councillors, the mayor does not have just one vote. He has a casting vote as well, which we have recently seen used to push through the controversial Lovelock Ave realignment. University Council roles, and the all-important powers of appointment of committee chairs, deputies, appointments to outside organisations, and the apportionment of councillor remuneration. These mayoral decisions do require a majority new council vote, but in practice they pass without real challenge and, most recently under Mayor Dave Cull, without any dissension or debate. The mayor is able to review all appointments throughout the triennium and is also able to decide on councillor travel and conferences. All this mayoral discretionary power has resulted in varying degrees of mayoral sucking up by councillors and others, some of it quite extreme during my 2004-2007 term. It is a strong mayor, indeed, who is immune from flattery, allegiance, and inevitable false praise, when so much depends on mayoral favour. The mayor’s extensive influence on decisions made by Dunedin’s biggest business and lawmaker also makes mayoral favour vital to many big business operators. A sympathetic mayoral ear can be worth a great deal to businessmen wanting rezoning, planning permission, roading and other big infrastructure projects. There has been some criticism of the mayoral salary being almost three times that of a councillor’s annual $40-something thousand, but in my view it is a small recompense for what is an all-consuming, totally public, 365 days per year job. As with councillor remuneration, I do not believe it is a salary at all, rather a retainer to allow non-millionaires to afford the time to devote to civic service. The job of mayor easily rivals that of the highly paid DCC CEO in importance to Dunedin, and any failure by the mayor to completely fill this role can lead to staff, the CEO and/or businesspeople filling the vacuum. The kind of bureaucrat/public-representative relationship hilariously illustrated in the BBC series Yes Minister has rung quite true in recent years for our local government. With the election of Mr Cull I hope that this master-civil-servant situation will change and that elected representatives will now drive policy, projects and priorities, instead of being driven by staff managers. DCC staff are generally permanently employed, while elected representatives come and go at the whims of voters and an inscrutable STV computer programme. This asymmetry between permanent staff and transitory elected representatives creates an imbalance of experience and information, which a particularly aware mayor can often redress through the wide-ranging powers and influence of his office. In Mr Cull’s first two weeks prior to officially gaining office, he has already made many decisions that matter, from appointments to remuneration to Lovelock Ave and a host of other issues. At the risk of being accused of sucking up, I think that so far he has done very well. The exception to Mr Cull’s promising start might be his apparently unsympathetic response to council candidate Bev Butler’s request for an assurance of immunity from significant election recount costs above the $750 deposit she had paid. Our mayor has exceptional powers and responsibilities, but I doubt that a yet-to-be-inaugurated mayor has the power to give such assurances. It is a shame that sincere deposit-paid Bev is denied a recount of a bizarre STV system because she is not a millionaire, when common criminals get to appeal much more expensively with complete financial immunity every week. If you strip away the false modesty, competition and insecurity that is rife among councillors, I believe that most would accept the mayoral chains in a heartbeat if given the opportunity. Most of us really want to make a positive difference to the wellbeing of Dunedin, but we know that it is the role of the mayoralty that really matters. – Lee Vandervis is a newly-elected Dunedin city councillor and is a former Dunedin mayoral candidate. 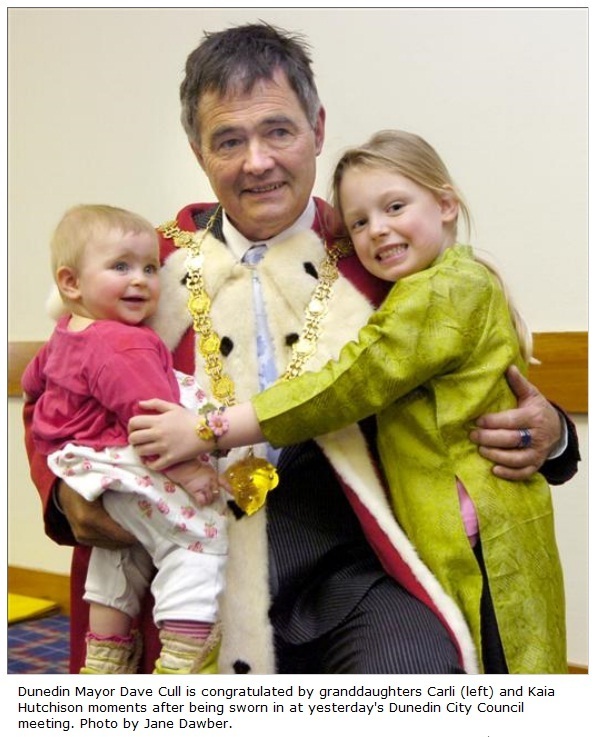 Dunedin Mayor Dave Cull donned the robes and chain of office for the first time yesterday, pledged to do his best and received an enthusiastic hug from two future ratepayers. It was not a bad start to his first official day in office, even if the future ratepayers in question were his granddaughters, Kaia Hutchison (5) and her 6-month-old sister Carli. The young pair were among a packed public gallery of friends and family watching as Mr Cull and the city’s 14 councillors were sworn in at yesterday’s inaugural Dunedin City Council meeting for the new term. However, he was “very aware” of the responsibilities that came with the job, as well as the community’s expectations. Mr Cull outlined plans to address council operating costs, while continuing the development of the city’s infrastructure, particularly digital infrastructure, and making the city more resilient to economic challenges. “We all know what a tightrope that could be. It’s not an easy job,” he said. Cr Paul Hudson praised Mr Chin’s devotion to the city. “I have never worked with a mayor who has given so much of his time and so much of his self, and given up so much of his family life, to serve his community,” he said. I enjoyed reading Saturday¹s revealing feature article on Mayor Cull, but there were two factual errors which jarred. The first was ” – not least the city¹s debt, which has soared with the building of the Forsyth Barr Stadium”. The truth is the city¹s debt had already soared without the Stadium, soaring tenfold since 1999 from $32.5 million to $360 million this year [see front page ODT 05/01/2010] Most Stadium debt has yet to come. 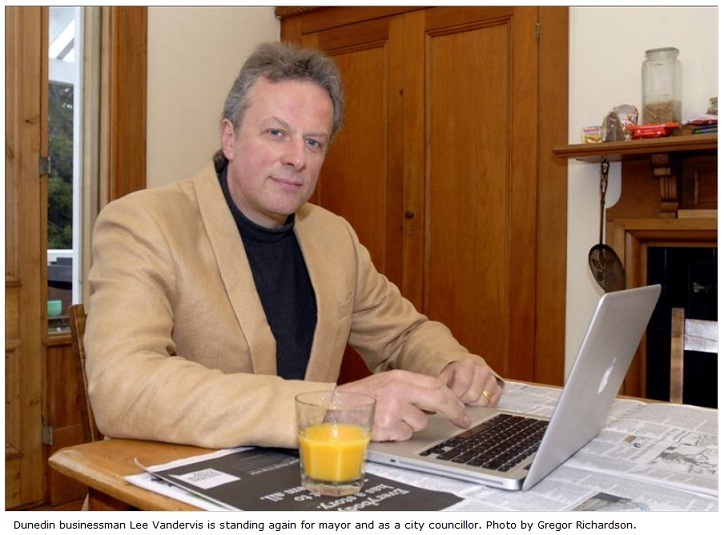 The second was the labelling of Lee Vandervis as a “Firebrand councillor”. My Oxford dictionary defines firebrand as “a cause of trouble, esp.a person causing unrest.” I have been a messenger of DCC trouble, but anything but its cause. While on Council I helped to put the brakes on many excesses including the Town Hall development and the even more excessive new Stadium. The cause of trouble was a secretive spendthrift bureaucrat-driven Council which refused Dunedin a referendum or meaningful say in major decisions. He has presented television programmes such as Renovators, Open Home, Town and Country and Master Builders’ House of the Year Awards. He has written and published many books, including Big Weather South. He was born in Invercargill, remains a fan of Yes Minister and has a taste for Central Otago wine. His name is Dave Cull and, on October 26, he will be sworn in as the 57th mayor of Dunedin. Mark Price spoke to him this week. Dave Cull strides across the second floor of the Civic Centre building and approaches the mayoral office. “Come on in,” he says briskly to this Otago Daily Times reporter as he produces the keys of office. There are at least 20. Few appear to have labels and none he tries will work in the mayoral office door. Mr Cull’s new secretary comes to the rescue and in a moment, with her help, the new mayor is in his new office – one small obstacle overcome. The man who has travelled India and Africa, worked on building sites, written books and hosted television programmes has stepped into a job – delivered to him by 22,832 voters – that is strewn with far larger obstacles. Not least of them is the city’s debt, which has soared with the building of the Forsyth Barr Stadium. Mr Cull opposed the stadium, but does not entirely accept he has the stadium to thank for getting the city’s top job ahead of former mayor and stadium supporter Peter Chin. He believes the community remains “brassed off” at having the cost of the stadium “imposed on them” but accepts it is going ahead and people “at least want to give it a chance to see how it will go, and then we’ll see”. Mr Cull says his opposition was “never about the stadium”. He believes it is now for the council to ensure no inefficiencies are created in the running of the stadium. When announcing victory last weekend, Mr Cull talked of being given a mandate for change. However, on day three of his mayoralty, when given the opportunity to spell out the changes he would like to see happen, there is more talk of “tweaking” than of instant or radical change. Near the top of Mr Cull’s list of concerns is how the city deals with what he calls the challenge of “imminent energy-cost rises”. What would happen, he asks, if the price of petrol was four times what it is now? “How will people even be able to commute to work?”They’re the challenges that are facing us. Mayor Cull stands by his campaign message to cut costs but is saying little about how. “In a sense, it’s not my role to identify exactly where they need to be cut. But council will require [cuts], and it will, I believe, come with doing things differently. “I don’t think there’s much room for cutting services. To illustrate the point, Mayor Cull suggests if the library is not being used at a particular time then questions could be asked about why it is open then. “I think that there are always more efficient ways of doing things to get the same result and often it’s a matter of liberating the staff’s ideas. The council’s only direct employee is chief executive Jim Harland, whose contract runs until March 7, 2012. Mr Cull begins to answer a question about how well he can work with Mr Harland, and then deflects it. He suggests the new council will be providing Mr Harland with cost-cutting targets, but he will not provide more information. “I can’t because the directive will come from council, not from me. He emphasises there will be more than just talk about cutting costs. “It’s absolutely imperative. We can’t afford to keep the rate rises going the way they are projected. “We don’t actually have any choices. We have to cut our costs if we are not going to just stagnate. “We could just stop and say `right, we’re not going to do anything new for the next 10 years while we pay off the debt and we’ll just try and keep our rate rises down’. “We can’t afford to do that. There are challenges to be met and things to be done and expectations on the part of the community. Mr Cull believes, though, that cutting council staff is not the clever way to cut costs. Mayor Cull says he wants to review all city assets, projects and debt, but his first priority will be to look at operating costs rather than existing capital expenditure. “If you chop capital expenditure, which is debt, you save yourself whatever the interest rate is, say it’s 8%, so if you knock out $1 million of capital expenditure you save $80,000 a year. “If you chop out $1 million of operating costs, you save $1 million a year on the rates bill. So you actually give yourself more leeway by cutting operating costs, if you can. Mr Cull will be sworn in on October 26 and by then he will have decided who his deputy mayor will be. He rules out “some people who might make quite good deputy mayors” because they have indicated they do not want the job. With just three new councillors, Mayor Cull does not believe factions will develop. “There’s always room for factions, but they’ve got to have a reason to create a faction. Mayor Cull is looking at “just slightly” tweaking the committee structure. He considers the way chairmanships are allocated “can be perceived as a way of getting people on board”. If there is a project close to the heart of the new mayor, then it might be a modern addition to the infrastructure that lies at the heart of local bodies’ work. A 21st-century addition to the established triumvir of sewers, water reticulation and roading. Mr Cull heads the “Digital Dunedin” steering committee, which aims to facilitate better, cheaper broadband. He acknowledges there are “squillions” of dollars to be spent. “We never anticipated that the city would be paying for all of it. “What we did when we developed the digital strategy was we wanted to identify what things we needed to strengthen and where they needed to be strengthened. He notes the council is paid for roading it provides “indirectly”, from rates. “Now you could see wireless infrastructure the same way. “The council may help facilitate putting it into place, but you wouldn’t necessarily pay the council to use it. You might get on to it and then pay your ISP for the use of it for instance. “I view digital infrastructure as essential infrastructure. “The challenge is, do we get into bed with Telecom? Do we try and get central government funding? At that point, Mr Harland enters through the mayor’s open door to confirm their “9.30”. And, as the ODT departs, a brisk and cheerful new mayor says he hopes he has not been “too evasive”. After all, he says, it is only his third day. Where does the new mayor stand? Communicating with the public: One of the things I am going to do is have a regular media forum … any questions they want to ask … not just talking about decisions that have already been made. If we are in the throes of wrestling with a particular issue, it’s not a bad idea to say ‘well on the one hand there are these variables and on the other hand there are these problems and we’ve got to balance these and we’re working our way through them’. That way, I think, the community, through the media, will have the ability to understand a bit more broadly and it might engender a bit more informed debate and appreciation. Legal water: I think I’m still informal. I don’t drive that process. In fact, I’ve had to stand back from it. The council officers are dealing with it expeditiously and efficiently. (In April, Mr Cull admitted to using an illegal water connection to the council water main at his Portobello home). Development – this week confirmed a lack of “sufficient evidence” meant a full investigation into last month’s accident would not be carried out. That was after a volunteer working for Mr Vandervis pierced an 11,000-volt power cable buried beside Quarry Rd, Mosgiel, while hammering in a steel peg to secure an election sign. The damage caused the cable to fail later, cutting power to 747 consumers, but Mr Vandervis said it was lucky nobody was killed. A spokesman for Aurora Energy Ltd – the Dunedin City Council company that owned the cable – agreed “the potential for serious harm was present”. Energy Safety launched an initial investigation after council staff said Mr Vandervis was not at fault, and the presence of the cable under the designated election advertising site was not known. However, ministry spokeswoman Tracy Dillimore told the Otago Daily Times the initial investigation had found the cable was buried at an appropriate depth, 670mm underground, and was protected by a buried shield as required. She also stressed the incident was not “reportable”, because nobody was injured, and she blamed Mr Vandervis’ volunteer for installing the sign outside the designated election site. The claims were rubbished by Mr Vandervis as “a barefaced blatant misrepresentation of the truth”. He provided the ODT with a photograph he took, which appeared to show part of the same 11,000-volt cable buried, without protection, at just 475mm. New Zealand rules did not stipulate minimum depths for cables, but Australian codes required 750mm for protected high-voltage cables and 900mm for unprotected cables. The damaged cable was maintained on behalf of Aurora by Delta Utilities Services, another council-owned company. Mr Vandervis said Delta had “a major problem on their hands” if other 11,000-volt cables were buried at shallow depths. “If they’re burying 11,000-volt cables without any protection two feet in the ground, they are going to have millions of dollars in liability for the first digger driver that hits one and kills themselves. “I have discovered a problem and it needs to be publicised to prevent someone from actually getting killed. Ms Dillimore would only say the section of cable photographed by Mr Vandervis was not the damaged section, which she insisted was buried at 670mm. Mr Vandervis said he photographed an undamaged section of the same cable, a few feet from the damaged section, because a measurement tape could run straight down to the undisturbed section of cable. The photograph still showed an 11,000-volt cable buried at a dangerously shallow depth, he argued. Claims his sign was installed outside the election sign site were also “absolute lies”, as the sign was on grass at the designated zone and alongside other candidates’ signs, he said. An ODT photograph taken last month appeared to back his claims, showing the damaged cable was under grass about 1m from a nearby footpath. The ODT also found Energy Safety’s investigation involved speaking to Delta staff, but not council staff or Mr Vandervis, despite Energy Safety operations manager Mark Wogan saying last month “different people who are involved” would be spoken to. Ms Dillimore said the claim Mr Vandervis’ sign was in the wrong spot was based on a council map, provided by Delta staff, showing election advertising zones. She could offer no further details, referring questions to council staff. Council resource consents manager Alan Worthington, who oversees the election sites, said he was not aware of the claim. Delta chief executive Grady Cameron declined to be interviewed, saying in an email it was “not appropriate” to comment. Criticism pre-election polling could skew results or put people off voting is not supported by academic evidence, a University of Otago political studies department senior lecturer says. Polling has come under fire for the possibility it may stop people from voting if their chosen candidate is either well ahead, in an apparently unassailable lead, or well behind, with no hope of winning. There has also been a suggestion it could be “self-fulfilling”. But Dr Chris Rudd, of the University of Otago, said yesterday, from an academic point of view, there was “no clear-cut evidence that polls influence turnout, or have a bandwagon or underdog effect”. The Otago Daily Times, and other New Zealand newspapers, published the results of pre-election polls during this election, as has been done in the past. The ODT published two polls of the city, one on September 26, and one on October 6, three days before voting closed. The first poll showed the eventual winner of the Dunedin mayoralty, Dave Cull, ahead with 45.9% to incumbent Peter Chin’s 37.4%. In the second poll, Mr Cull’s support stood at 54.2% – 5.9% less than he eventually received on election night. Mr Chin’s support in the second poll was at 31% – 0.4% less than Saturday’s vote. Federated Farmers last week criticised the publication of polls in Auckland and Christchurch – both of which correctly predicted the winners – before the elections closed. President Don Nicolson asked why local elections were treated differently from general elections. Mr Nicolson said the Electoral Act prohibited the publication or broadcast of election-related material after 6pm on the day before a general election, until booths closed. “It includes a complete ban on election-day opinion polling, for the simple reason it could influence voters. Mayoral candidate Lee Vandervis also criticised the polls, and said after the September 26 publication they were illegal in some countries because they potentially gave the media opportunities of skewing voting behaviour. Mr Vandervis said he believed the increasing ease of producing surveys with new technology would probably see a trend to more surveys in the future. He saw the “tendency for them to be self-fulfilling”. But Dr Rudd said there had been “heaps” of studies on the issue. Those included experiments using mock polls to study behaviour, and there was no clear evidence of a “bandwagon effect”, or of people voting for an underdog. As Mr Cull received less support than the ODT poll predicted, there had been no “bandwagon” effect. Dr Rudd noted Mr Vandervis’ support had gone up after the polling showed him with little chance of winning. Of the ODT poll, Dr Rudd said the differences between the poll and the actual outcome were “remarkably small” and it would be odd if there were no changes in voting between the poll and polling day. The ousting of Peter Chin as Dunedin mayor “doesn’t make sense”, but is unlikely to affect progress towards completing Forsyth Barr Stadium, Carisbrook Stadium Trust chairman Malcolm Farry says. Mr Farry said yesterday he did not believe Mr Chin’s removal – together with pro-stadium councillors Richard Walls and Michael Guest – amounted to a clear vote against the stadium. The decision by the outgoing council, led by Mr Chin, to commit to the $198 million project appeared to be one of the factors contributing to his dismissal, but could not by itself explain the result, Mr Farry said. The result came as Mr Farry said he detected a noticeable improvement in the public mood towards the controversial project. Instead, the combined cost of a variety of capital projects – including the stadium but also others, such as the town hall upgrade – had created a perception of debt problems, he said. That had been fuelled in part by “scaremongering” over debt that “frightened a number of people”. “It’s difficult to interpret the result of the mayoralty as having its foundation around the stadium, because that should’ve meant that some or all of the other councillors who supported it should not have been returned. Saturday’s results see Mr Chin and Crs Walls and Guest replaced by former Otago District Health Board chairman Richard Thomson, returning one-term councillor Lee Vandervis and first-time councillor Jinty MacTavish. Mr Farry said he was not sure what approach the new council would take to the stadium, but did not expect the project to suddenly be halted. While incoming mayor Dave Cull had opposed its construction, he had also indicated a willingness to ensure it was successful, once it was clear the stadium was to be built, Mr Farry said. “I can’t imagine that anybody could say we are going to pull the plug on it [the stadium]. I don’t know what you’d do with it sitting there for the next 50 years, unfinished, so close to being finished. “There’s nothing that indicates to me the new mayor [Mr Cull] and council would not want to make sure we complete on time and on budget. Dunedin Venues Management Ltd chief executive David Davies said the stadium “ship” was “effectively mid-journey”, but expected to brief incoming councillors in due course. “I think there’s going to be a lot of questions because they are closer to it now than they would have been previously. Southern councils are in for a shake-up after voters demanding change across Otago handed the mayoral chains to four new leaders. In Dunedin, outgoing mayor Peter Chin paid the price for backing the $198 million Forsyth Barr Stadium, with a wave of unrest over the project and the city’s debt helping Cr Dave Cull seize the mayoral chains. Elsewhere, long-serving incumbent mayors Malcolm Macpherson (Central Otago) and Juno Hayes (Clutha) were both unseated, while Cr Vanessa van Uden won her bid to replace outgoing Queenstown Lakes mayor Clive Geddes and become the district’s first female mayor. Dunedin’s contest turned into a comfortable victory for Cr Cull, who won 21,757 votes, well ahead of Mr Chin, with 14,084 votes, and third-placed Lee Vandervis, with 5917 votes. It was the first time since 1995 a sitting mayor had been ousted in Dunedin, and Mr Cull told the Otago Daily Times his initial reaction was “relief”. He believed the vote was a mandate for change. Mr Chin was yesterday looking forward to stepping down from public life. He accepted the majority had not agreed with many of the decisions the council had made, and, as mayor, he had taken the brunt of that. However, he did not resile from the record of the councils he had led. The trio were followed by four other Dunedin mayoral aspirants, led by Aaron Hawkins (1527 votes), Olivier Lequeux (1164), Kevin Dwyer (197) and Jimmy Knowles (124). The election also claimed two more high-profile casualties, with incumbent councillors Richard Walls and Michael Guest both cast aside in favour of former Otago District Health Board chairman Richard Thomson, former councillor Mr Vandervis, and Jinty MacTavish – the youngest councillor at just 25. Controversy over council finances also drew higher numbers to the ballot box, with 45,240 voters having their say as turnout in Dunedin rose to 52.49%, up from 47.47% three years ago. Mr Cull told TV3’s The Nation that he aimed to “cut operating costs without touching services”. The focus on finances was not unique to Dunedin, with the need to control rates a key focus for new Queenstown Lakes mayor Ms van Uden. She received 5087 votes, twice as many as her nearest rival, Simon Hayes. Ms van Uden said she would be focused on finding ways to reduce pressure on rates. Alexandra businessman Jeff Hill, who took 31% of the vote. Mr Macpherson received just over 30%. In the Clutha district, Bryan Cadogan was celebrating at his Balclutha home after unseating Mr Hayes by 354 votes. Waitaki district voters were the only ones to retain their leader, with Alex Familton returned for a second term with 4545 votes. His nearest challenger was deputy mayor Gary Kircher (3362). When Dunedin Mayor Peter Chin spoke to the final city council meeting earlier this month, his words read like a valedictory speech, a farewell from office, and such has proved to be the case. His campaign offered few positive ideas for the future for worried Dunedin ratepayers and residents, especially given the debt load agreed by the two councils Mr Chin had led for the past six years. He may be remembered with greater charity in the decades ahead, as he had hoped, but on Saturday voters punished him as harshly as they did two other senior city councillors associated with him, Richard Walls – a former mayor – and Michael Guest. Those especially who supported the council’s share of funding the Forsyth Barr Stadium did not appear to be wounded by voters, despite so much negative campaigning by groups such as DCC Inc (formerly Stop The Stadium): seven were re-elected. It was, after all, not a particularly logical reason to vote out Mr Chin and his supporters, but was perhaps understandable. The Mayor-elect, Dave Cull, has promised to “rebuild trust”, “listen to the community”, to “cut operating costs” and “limit rate rises to affordable levels” – all fine-sounding sentiments that actually mean not much in practical terms. The functions of the community plans, which fulfill so much of a local body’s capital planning today, provide a formal opportunity for citizens to be heard. The question of what constitutes “affordable” rates in Dunedin for the next decade or more has essentially been determined by the spending practices and debt commitments of the past two councils. Mr Cull’s Greater Dunedin group, which succeeded with four seats on the council, now has a further opportunity to built itself into a formidable ticket. The mix of experienced councillors and two novices Richard Thomson and Jinty MacTavish together with the return of Lee Vandervis, imply a council that will acknowledge public concerns and pressures far more promptly than occurred under Mr Chin’s leadership, especially in the most recent term. Fresh faces abounded elsewhere in Otago as voters sought change. Significantly, several of the new district mayors also campaigned on a cost-reducing platform. Long-standing Clutha incumbent Juno Hayes was defeated by newcomer Bryan Cadogan, and Central Otago replaced its three-term mayor, Malcolm Macpherson, with his deputy, Tony Lepper. The scale of Dr Macpherson’s defeat, and the possible reasons for it, were a talking point throughout the region at the weekend. Vanessa van Uden became the first woman mayor of the Queenstown district, easily defeating her male rivals. Ms van Uden, who has just one term’s experience as a councillor, will replace the retiring mayor, Clive Geddes. She will lead a council faced with immense and expensive challenges in the immediate future, as the fastest-growing area in the country must deal with debt and with vital infrastructure expansion and services while trying to maintain and build on its international reputation as a year-round visitor-destination. Waitaki voters, meanwhile, re-elected Alex Familton for a second term. Nationally, Invercargill returned Tim Shadbolt with a convincing majority over country music singer Suzanne Prentice, perhaps reflecting her low-key campaign and her rival’s unmatched public profile. Sitting Mayor Kerry Prendergast only just holds Wellington and may be defeated when all the votes are counted, and Bob Parker easily won Christchurch from Jim Anderton, helped, no doubt, by his outstanding public profile during the Christchurch earthquake, but – given this vote of confidence from his citizens – will now be expected to match word with deed. Much public attention was directed to Auckland where voters were faced for the first time with selecting a mayor for a unified city. They chose both a left-leaning candidate in Len Brown and a left-leaning council, ejecting relatively heavily the incumbent mayor of Auckland, John Banks, a former National Party cabinet minister, for a man whose popularity in the poorer suburbs and cities of greater Auckland was built on his appeal among ethnic minorities, in particular, and on a very active campaign. His status now as mayor of New Zealand’s largest conurbation has the potential to carry with it great political power – a prospect that has not been lost on the major parties. While there will be regret in some quarters in Otago that experienced representatives such as Messrs Chin, Hayes and Macpherson, Walls and Guest have likely been lost to local body service – collectively their knowledge is vast of what is today a complex and substantial branch of government – elections provide an opportunity for everyone to look forward. The successes and failures of the past, the controversies and arguments of yesterday, best belong there so that all effort can be focused on the challenges ahead, to building a safe, secure and affordable future for every citizen. And to that end we all owe a considerable debt of thanks to those who put their names forward to represent our interests; but what a pity the level of polling remains so low. Dave Cull, who stood on a platform of prudent financial management, has comfortably deposed two-term incumbent Peter Chin as Dunedin mayor. Final vote totals after preferences were transferred and candidates had been excluded were: Dave Cull 22,832; Peter Chin 14,453; Lee Vandervis 6,692; Aaron Hawkins 1745; Olivier Lequeux 1204, Kevin Dwyer 208, Jimmy Knowles 124. At a barbecue at his Portobello Rd home, surrounded by family and Greater Dunedin colleagues, Mayor-elect Cull (60) said his initial reaction was “relief”. “It confirmed my hopes,” he said of the result. Now, though, was the “challenge” of the new council. Mr Cull, a writer who has served one term as a councillor, said he had already received a telephone call from outgoing Mayor Peter Chin, in which Mr Chin congratulated “very graciously” him on his win. Mr Cull said his first job as mayor would be to regain the trust of the community, by engaging with it more constructively. First preference votes were: Dave Cull 21,757; Peter Chin 14,084; Lee Vandervis 5917; Aaron Hawkins 1527; Olivier Lequeux 1164, Kevin Dwyer 197, Jimmy Knowles 124. Seasoned campaigners Richard Walls and Michael Guest have been dumped from the Dunedin City Council while new mayor Dave Cull’s Greater Dunedin team has secured four seats. The preliminary result shows three new faces: former Otago Health Board chairman Richard Thomson, film-maker and youth worker Jinty MacTavish (both Greater Dunedin) and businessman Lee Vandervis, a former councillor and unsuccessful mayoral candidate. The rest of the council has a familiar look, with the exception of Messrs Walls and Guest. Some had expected councillors who had voted for the Forsyth Barr Stadium may be voted out, but that has clearly not happened, with seven of those elected having voted throughout the stadium debate for it to go ahead. Central Ward: Richard Thomson (Greater Dunedin), Lee Vandervis, Bill Acklin, Jinty MacTavish (Greater Dunedin), John Bezett, Chris Staynes (Greater Dunedin), Neil Collins, Teresa Stevenson, Fliss Butcher, Paul Hudson, Colin Weatherall. Mosgiel Taieri Ward: Kate Wilson (Greater Dunedin), Syd Brown. Waikouaiti Coast-Chalmers Ward: Andrew Noone. Dunedin mayoral candidate Lee Vandervis says it is lucky nobody was killed, after a volunteer installing one of his giant election swings sliced into a buried 11,000-volt power cable near Mosgiel. The damage occurred on Sunday as one of Mr Vandervis’ volunteers hammered in a steel pin to secure one of the large metal election swings – holding signs promoting Mr Vandervis’ mayoral bid – beside Quarry Rd, Mosgiel. The cable failed a short time later, at 1.04pm, cutting power to 747 consumers from East Taieri to Taieri Mouth for 40 minutes, a spokesman for Dunedin-based lines company Aurora Energy confirmed. The site was one of the Dunedin City Council’s designated election advertising sites, but the Aurora spokesman confirmed there were no warnings in the area of the cable’s presence 0.6m below ground. “The potential for serious harm was present,” the spokesman said. Mr Vandervis said it was lucky nobody was killed, as another “few millimetres” would have been enough to trigger a shock up the pin that would have left his volunteer “as dead as a door-nail”. He blamed council staff for not warning candidates about the existence of the cable under its designated election advertising site and urged other candidates to use caution. The cable is owned by Aurora, a Dunedin City Council-owned company, which contracts another council-owned company, Delta Utilities Services, to maintain the network. Council resource consents manager Alan Worthington said Mr Vandervis’ sign did not breach election rules, but the existence of the cable had come as a surprise. He would be speaking to Delta staff about the cable, and the “possible” existence of others under other election sites, and information would then be passed to candidates, he said. “It’s a bit of a surprise, given those sites have been used for quite a few elections now. “We are in the process of finding out if there are any others scheduled sites that might have a cable under them,” he said. The cost of damage to the cable had not yet been determined, but it was possible Aurora would seek to recover costs from Mr Vandervis, the Aurora spokesman said. When damage to the company’s assets was caused by a third party “sometimes we like them to pay”, he said. Mr Vandervis said he would contest any attempt by the company to recover costs from him. Giant swings promoting Dunedin mayoral candidate Lee Vandervis might tower over their rivals, but they do not break election campaign rules, Dunedin City Council staff say. The swings appeared around Dunedin during the weekend, with three of the large steel structures installed at Maia, Mosgiel and Caversham, and five smaller sets elsewhere around the city. Mr Vandervis, who is standing for mayor and as a city councillor, said he had received a “fabulous” response to his promotion. However, the swings had also raised a few eyebrows among council staff, who told the Otago Daily Times they would be talking to Mr Vandervis about ensuring the swings were safe. Council resource consents manager Alan Worthington said the swings complied with rules governing election signs, which restricted signs – but not the structures that held them – to a maximum size of 3sq m.
Council chief building control officer Neil McLeod said council staff would speak to Mr Vandervis to ensure he understood the requirement to ensure the swings were safe. “In all honesty, we have no real interest in it so long as they’re not dangerous. “They are a very lightweight structure … so long as they’re not going to blow away, then we have no real issues with them. Mr Vandervis said he had carefully checked election rules before installing the swings, and his signs measured only 1sq m.
“It doesn’t even begin to break any rules,” he said. The larger frames were made from old scaffolding pipes, secured together by studs and by bolts into the ground, and were “absolutely solid as a rock”, he said. What do you know about the candidates who are contesting Dunedin’s mayoral campaign in the 2010 local body elections? Today, in the second of a seven-part Mayoral Profile series, Chris Morris puts the questions to Lee Vandervis. Marital/family status: Married (second time), eight children between them. Occupation: Acoustic engineer (working from home)/businessman. Council experience: Dunedin city councillor, 2004-2007. Running for: Mayor and council (central ward). Outspoken businessman Lee Vandervis (55) is back for another crack at the Dunedin mayoralty. After a sole term as a Dunedin city councillor, Mr Vandervis was voted out by the narrowest of margins – just four votes after special votes were counted – when he stood again as a councillor, and for the mayoralty, in the 2007 local body elections. Still a passionate critic of the Forsyth Barr Stadium and the city’s debt, Mr Vandervis is promising more frugality and a focus on cutting council costs, as well as initiatives to help revitalise Dunedin. I’m standing basically because I think I’m the only one who can dig Dunedin out of its hole of debt at the moment. Well, I saw it coming. If you go back to a paper I produced for council in 2006, it outlined the way of reversing the inevitable … debt increase [and] rates increases. It was just on a page; I worked very hard to get it on a page, and it gave, line-by-line, 30 different suggestions for reducing the rates by anything up to 5%. It’s still quite relevant now. Most of the things on it are things we needed to do then, and we need even more to do them now. We have reached the prudential limits; they [the council] have misled the public about how much the stadium’s going to cost. Everything’s been done on debt. The direction of the city council has been for vanity projects; there’s no other word for them. Lovely things though the Chinese Garden and the stadium are – they’re very lovely things but completely unaffordable and just inappropriate for Dunedin. What are the major issues facing Dunedin? No 2, how we start to focus back on quality of life for ordinary Dunedin people. We have got a city council that spends a lot of its money outside Dunedin, doesn’t support Dunedin business, so a “spend local” campaign is vital. The nominally higher amounts you might pay a local business to do something would be recouped almost immediately with the dollars circulating locally, plus it would give that business the opportunity to expand, to grow and to actually upskill or improve whatever they are capable of doing to meet what the outside competition would be doing anyway. Reversing the debt situation is an absolute must. You simply can’t go putting more and more of your rates every year into interest payments. Another issue that we have got to confront is that the stadium is only a shell and is not workable as is. The stadium lacks all the electronic scoreboards, the turnstiles and everything else that you’ve got to have in the stadium to make it work, and its also insufficient of a whole lot of other things. Dunedin can’t produce those amounts of money. I think people in New Zealand generally believe in a big covered stadium in Dunedin as well, and a lot of them would buy tickets every week or so, especially if – as well as cash prizes – you had prizes like, you know, Carisbrook seats which could be used for garden furniture, signed footballs, sweaty Highlanders tops , whatever. What is your vision for Dunedin, and how will you make it happen? The particular vision for the city is basically to allow Dunedin to really be all that it can be. Dunedin has, almost, an art industry. It doesn’t have one in fact, but all the potential for it is here. The artists are here, a lot of the product is here … but it’s not marketed properly. This is something the DCC could definitely help a lot with. We have got a lot of music talent in this city, but again, it’s not co-ordinated, it’s not promoted, it’s not really an industry. What we do do well, and have done well, here in Dunedin is sport. My future vision for Dunedin is to have a similar vibrancy in things like the arts and heritage and the tourism that would go with that. So, a city council that is much smaller in terms of bureaucracy but much bigger in terms of how it can actually recognise the talent we have in Dunedin and actually market and promote it, nationally and internationally. How would you achieve those things? What specific steps would you take? For a start, I would stop all the rates relief stuff that has been happening. This has been pouring millions into dinosaur industries which have left Dunedin, anyway. Rates relief is a scandalous waste of money. I would love to see that kind of money redirected. For instance, in the music area, simply by providing or opening up practice rooms for young bands. That sort of thing is what you need to sort of get the starters of the music industry going. Similarly with the art industry. It just could be done so much better. Do you like the teeth as a work of art? They don’t have any particular aesthetic appeal, and the fact they are designed to sort of go mouldy with limestone . . . I don’t think that’s the kind of image we want to be presenting in Dunedin. What strengths would you bring as mayor? There’s going to be a mix of old councillors and new councillors in the new council, and I think that I would be a good referee between the Chin team, if you like, of the older councillors, and Cr Cull’s newbies. I think I would be able to allow the enthusiasm of the new councillors and the experience of the old councillors to be capitalised on and be a referee between the two teams. If … Cr Cull or Mayor Chin becomes the mayor again, you are going to have a very lop-sided council and a lot of infighting, I believe. With me as mayor, I think I could actually reduce that and get the best out of the councillors that do make it. Do you see yourself as a moderating influence, or a middle ground somewhere? I see myself not as moderating – not at all – but I do see myself as impartial and independent. I am not somebody who owes anybody anything. I’m not someone who has a team to look after. I’m somebody who I believe as a mayor would be sufficiently independent to actually look at the needs of all Dunedin people generally and then draw on the strengths of whoever is elected to actually achieve those. I’m also somebody who is not afraid to give people bad news and not afraid to let people know exactly what’s going on. One of the things that cost me the last election was that I told people they couldn’t afford a stadium, and that the idea that we could do it for $188 million was a gross misrepresentation. I knew it was bad news. I knew it wouldn’t go down well, but I said it anyway, because someone had to say it. And the same in this election. If you look at everyone else, they’re saying, ‘We want this wonderful, we want that wonderful,’ but nobody is saying how they’re going to do it. I’m telling people, ‘Look, this is how you’re going to do it’ and some of these things are not pleasant. Other than being on the city council [2004-07] … not a hell of a lot. I’ve always run my own business, which has usually taken up most of my time until I got on council. I sold the lighting business and the shop and everything else I used to have when I got on council. In terms of committees and things, I’m on the [Dunedin] Rudolf Steiner School proprietors board at the moment. I do practical things for them like organise woodchips and gravel, and we just put some new heating systems in there; that kind of carry on. I used to be in Dunedin North Rotary as well. Straight out of my own pocket. I have a donations thing on my website, which went up only recently, and so far I’ve had no donations, so I’m basically just funding it out of my own pocket. I spent $20,000 last time, which was far too much, so I’m hoping not to spend any more than $10,000 this time. I don’t believe left-right works at all. In terms of wanting to make the bureaucracy efficient, I’m probably quite right-wing . . .
From a sustainability point of view I’m green, from a social point of view I’m probably red and from a ‘Let’s structure the business’ side of things as a city councillor I’m probably quite blue. I voted for the Greens last time. The reason I voted for them was they had this fabulous ‘vote for me’ poster, and it was a little girl. It’s for the children basically that I want to do this. But I would love to do something for Dunedin, especially to make it a much better place for our kids. My support base is probably again fairly wide, but it’s probably people that are looking for a significant change who don’t want more of the same. And I think you find them just about everywhere. Former city councillor Lee Vandervis has emerged as another contender for the Dunedin mayoralty. He announced yesterday he planned to stand for both the mayoralty and the council. Mr Vandervis joins Mayor Peter Chin and Greater Dunedin candidate Dave Cull in the race for the leading role on the local authority, and said yesterday to change the direction of the council, “the mayoralty has to be the starting point”. “The DCC is in real trouble. and I have always liked sorting out trouble,” he said when asked why he was planning a comeback. Mr Vandervis lost his seat on the council after one term at the 2007 election, after counting of special votes saw Cr Fliss Butcher retain the third Hills ward seat by just four votes. Mr Vandervis polled 6766 votes in the mayoral election that year, and indicated when a ward reshuffle was under way, and a large central ward became a possibility, he might consider standing. Yesterday, he said he would bring business and political experience to the council, and “an open and direct personality”. Asked why he thought the council was “in real trouble”, he said he was referring to council debt, parking changes, and the council’s role in the Forsyth Barr and Carisbrook stadiums, among other issues. Mr Vandervis said since 2007, having sold his lighting and hire business, he had continued to run a smaller scale business from home, spent time developing his small farm in Pigeon Flat, and selling timber that grew there.